Robert Pershing Wadlow (February 22, 1918 – July 15, 1940) was the tallest person in history for whom there is irrefutable evidence. Wadlow is sometimes known as the Alton Giant or Giant of Illinois because he was born and grew up in Alton, Illinois. 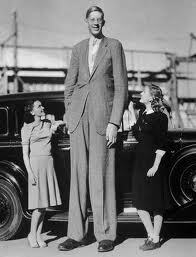 Wadlow reached 8 ft 11.1 in height and weighed 439 lb at his death at age 22. His great size and his continued growth in adulthood were due to hypertrophy of his pituitary gland, which results in an abnormally high level of human growth hormone. He showed no indication of an end to his growth even at the time of his death. That unseen portion begins with the principles and ideals that you believe are important in your life. Once you understand what is most important, you then can begin to behave in a manner that conveys the “who you are” to others.